New Delhi, India, 25th February 2015 :India’s much anticipated and most rigorous brand evaluation, The Brand Trust Report, India Study, a comparison of the trust held in brands, has been released for 2015. LG leads North as the Most Trusted Brand, followed by Samsung Mobiles which secures 2nd rank in both All-India and North as well. Hero Motocorp ranks 3rd in North, up twelve places from All-India. Sony is North India’s 4th Most Trusted brand, down one place from its All-India rank. Nokia secures North India’s 5th position as well as All India rank and Honda is at North India 6th up one place from its All-India rank. Bata at 7th in the North is up four places from its All-India position and Tata at 8th position is down four places, Amul at 9th in North betters its All-India rank by three slots and Maruti Suzuki at North India 10th is up six places as compared to All-India ranks. Last year the 5 Most Trusted North India brands were Samsung, Sony, Nokia, Tata and LG. The Brand Trust Report, the fifth in its series, is the result of a comprehensive primary research conducted on the proprietary 61-Attribute Trust Matrix of TRA (formerly known as Trust Research Advisory). This year’s study involved 13000 hours of fieldwork covering 2373 consumer-influencers across 16 cities in India and generated 5 million datapoints and 19,000 unique brands from which the top 1000 brands have been listed in this year’s report. The 190 page, hardbound report is available for Rs. 14000/-. The North zone cities include Delhi, Chandigarh, Lucknow and Jaipur covering nearly 26% of all the respondents. Chandramouli, CEO, TRA, said on the occasion of the report’s launch, “North India’s preferences have always been distinct and show distinct preferences for some categories over others. 19 unique brands which feature in 100 Most Trusted of North India are not seen in the 100 Most Trusted of the other three zones. Also, Delhi has always been known for its affinity for food and in the top 100 of North in this list are Bikaji, Bikano, Bikanervala, MDH and Choki Dhani, which do not feature in the top 100 of the other three zones.” Apart from this, other brands which feature in this zone top 100 but not in others are Action Shoes, Usha, Ayur, Jindal, Lava, Kingfisher, Maxima, Lee Cooper, Intex, Kent, Snapdeal, Khaitan, Lacoste, Pantaloons, he also said. Mumbai, India, 24th February 2015: India’s much waited brand barometer, The Brand Trust Report, India Study, a study comparing ‘trust’ held in brands, for 2015 has been released. 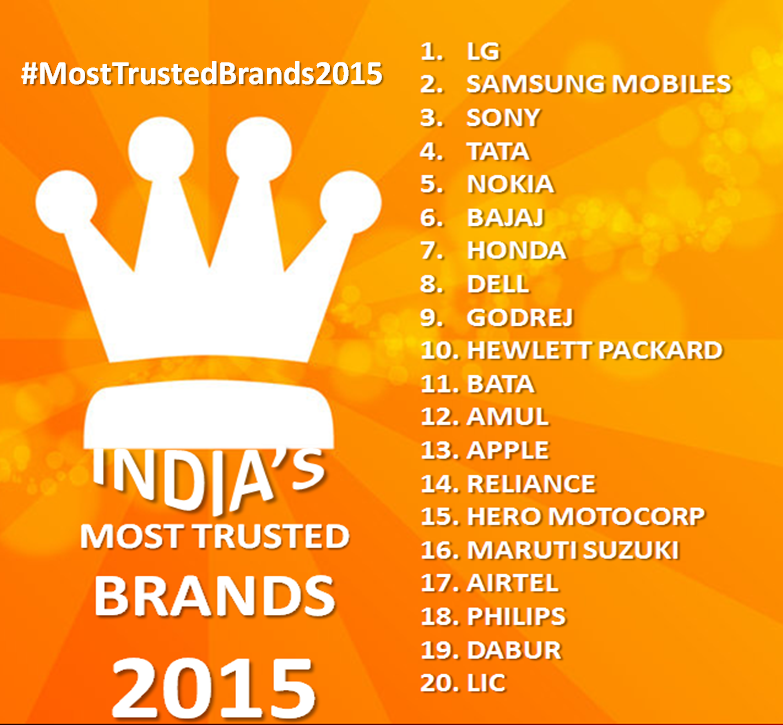 LG has been ranked as India’s Most Trusted brand in the study this year. The brand was ranked 4th in BTR 2014, 10th in BTR 2013, 3rd in BTR 2012 and 4th in BTR 2011, showing a consistent trust legacy. Samsung Mobiles is ranked India’s 2nd Most Trusted Brand, up 377 ranks over the previous year. Sony is the 3rd Most Trusted, followed by Tata ranked 4th (both are down one rank from last year) and Nokia is ranked 5th maintaining its rank of last year. India’s 6th Most Trusted Brand is Bajaj which has gained forty ranks over 2014 and Honda is ranked 7th Most Trusted gaining one rank over last year. Dell is India’s 8th Most Trusted Brand rising 46 ranks over the previous year, Godrej is India’s 9th Most Trusted (up seven ranks over 2014) and Hewlett Packard is the 10th Most Trusted in 2015. The report is launched annually by TRA (formerly Trust Research Advisory), a company of the Comniscient Group, a diversified communications group. The Brand Trust Report, the fifth in its series, is the result of a comprehensive primary research conducted on the proprietary 61-Attribute Trust Matrix of TRA (formerly known as Trust Research Advisory). This year’s study involved 13000 hours of fieldwork covering 2373 consumer-influencers across 16 cities in India and generated 5 million datapoints and 19,000 unique brands from which the top 1000 brands have been listed in this year’s report. The 190 page, hardbound report is available for Rs. 14000/-. Among India’s 1000 Most Trusted brands 270 categories were listed. The categories with the maximum brands were Food & Beverage represented by 185 brands, FMCG represented by 150 brands, Automobile represented by 67 brands and Personal Accessories represented by 59 brands. Some of the important category leaders in Brand Trust are LIC (BFSI), IIT (Education), Hindustan Petroleum (Energy), Colgate (FMCG), Amul (F&B), Dabur (Healthcare), Amazon (Internet), Hawkins (Kitchenware), Asian Paints (Manufacturing), Bata (Personal Accessories), Amitabh Bachchan (Personalities), KFC (Retail), Airtel (Telecom) and Air India (Transportation). New Delhi, India, 30th January 2014:India’s much anticipated and most rigorous brand evaluation, The Brand Trust Report, India Study, a comparison of the trust held in brands, has been released for 2014. Samsung leads North India and All-India as the Most Trusted brand, followed by Sony, which secures 2nd rank in both groups as well. Nokia ranks 3rd in North, up from fifth place All-India, and Tata is North India’s 4th Most Trusted brand, down one place from its All-India rank. LG secures North India’s 5th position, down one place from its All India rank. Reliance at North India 6th betters its All-India rank of ninth and LIC at 7th in the north is up seven places from its All-India position. Hewlett Packard at 8th position is down two places, Maruti Suzuki at 9th betters its All-India rank by one slot and Honda at North India 8th is up two places as compared to All-India ranks. Last year the 5 Most Trusted North India brands were Nokia, Samsung, Sony, BMW and Tata. The Brand Trust Report, the fourth in its series, is the result of a comprehensive primary research conducted on the proprietary 61-Attribute Trust Matrix of TRA (formerly known as Trust Research Advisory). This year’s study involved 15000 hours of fieldwork covering 2500 consumer-influencers across 16 cities in India and generated 5 million datapoints and 20000 unique brands from which the top 1200 brands have been listed in this year’s report. These brands have been classified into 284 different categories as against 213 categories in 2013. The North zone cities include Delhi, Chandigarh, Lucknow, Jaipur and Indore, covering 26.3% of all the respondents. The Brand Trust Report, India Study, 2014, lists each zone’s 500 Most Trusted brands. The ten top gainers out of the 322 brands which gained ranks in the North Zone as compared to their All-India ranks are, Abbott Labs (748 ranks), Addiction (734 ranks), Baidyanath (731 ranks), Dr. Reddy (727 ranks), Cycle Agarbatti ( 718 ranks), Jivi Mobile (718 ranks), Shine.com (715 ranks), Crossword (710 ranks), MTS Blaze (710 ranks) and SMC (692 ranks). The ten biggest rank losers out of the 173 brands which fell in ranks against their All-India ranks are Polo (-388 ranks), Oral B (-321 ranks), IFB (-283 ranks), YouTube (-271 ranks), Kissan (-264 ranks), Rexona (-256 ranks), Vim (-255 ranks), Paragon (-251 ranks), Tommy Hilfiger (-245 ranks) and Pizza Hut (-241 ranks). “Two hundred and thirty five brands in the North have a 50 rank gain or more, with one hundred and twenty five out of them having more than a 200 rank gain over All-India ranks. Fifty Eight brands out of the list also have a hundred rank fall or more”, Chandramouli added. Chennai, India, 30th January 2014:India’s much anticipated and most rigorous brand evaluation, The Brand Trust Report, India Study, a comparison of the trust held in brands, has been released for 2014. Samsung leads South India and All-India as the Most Trusted brand, followed by Sony, which secures 2nd rank in both groups as well. Nokia ranks 3rd in South, up from fifth place All-India, and Hero is South India’s 4th Most Trusted brand, gaining three places from its All-India rank. LG secures South India’s 5th position, down one place from its All India rank. Philips is ranked 6th, bettering its national position by six ranks in the South, and ranked 7th is Hewlett Packard, losing one rank from its All-India place. Tata slips five ranks in the South to take the 8th Most Trusted Southern brand and Puma, gains twenty-two places from its All-India ranks to secure 9th rank. Lux is the 10th Most Trusted Southern brand, improving its national rank by three places. The Brand Trust Report, the fourth in its series, is the result of a comprehensive primary research conducted on the proprietary 61-Attribute Trust Matrix of TRA (formerly known as Trust Research Advisory). This year’s study involved 15000 hours of fieldwork covering 2500 consumer-influencers across 16 cities in India and generated 5 million datapoints and 20000 unique brands from which the top 1200 brands have been listed in this year’s report. These brands have been classified into 284 different categories as against 213 categories in 2013. The South zone cities include Chennai, Bangalore, Hyderabad, Cochin and Coimbatore, covering 25.3% of all the respondents. The Brand Trust Report, India Study, 2014, lists each zone’s 500 Most Trusted brands. The ten top gainers out of the 321 brands which gained ranks in the South Zone as compared to their All-India ranks are, Birla Plus (694 ranks), Airwick (675 ranks), Ayur(662 ranks), Duracell (660 ranks), Morissons(646 ranks), Birla Corp (629 ranks), GRB (629 ranks), Yxtel(628 ranks), Lion Dates (625 ranks) and Envy 1000 (615 ranks). The ten biggest rank losers out of the 176 brands which fell in ranks against their All-India ranks are Kotak Mahindra Bank (-312 ranks), Haldiram’s(-301 ranks), Dabur Real (-279 ranks), Hyundai Santro(-279 ranks), Rupa (-274 ranks), Mircosoft (-273 ranks), Siyaram’s (-272 ranks), Lijjat Papad(-263 ranks), Tata Motors (-263 ranks) and Kent (-245 ranks). “Out of the five hundred brands listed, 321 gained South as compared to the national list with an average gain of 186.8 ranks per brand, and 176 brands were net rank losers, losing 81.7 ranks per brand. On a whole, more brands gained trust ranks in the South than lost as compared to the national averaged”, Chandramouli added. Mumbai, India, 29th January 2014: India’s much anticipated and most rigorous brand evaluation, The Brand Trust Report, India Study, a comparison of the trust held in brands, has been released for 2014. Samsung has emerged as India’s Most Trusted brand this year. Sony ranks as India’s 2nd Most Trusted Brand followed by Tata which has ranked 3rd this year. In 2013, the three brands had ranked second, third and fifth respectively. LG, ranks 4th in this year’s list, followed by the three year leader, Nokia, at 5th place. Hewlett Packard move up fourteen ranks over last year to become India’s 6th Most Trusted Brand and Hero leaps seventy-nine ranks to become India’s 7th Most Trusted. Honda is at rank 8th, followed by Reliance at 9th. Mahindra betters its last year rank by sixty-nine places to get ranked as India’s 10th Most Trusted brand. The Brand Trust Report, the fourth in its series, is the result of a comprehensive primary research conducted on the proprietary 61-Attribute Trust Matrix of TRA (formerly known as Trust Research Advisory). This year’s study involved 15000 hours of fieldwork covering 2500 consumer-influencers across 16 cities in India and generated 5 million datapoints and 20000 unique brands from which the top 1200 brands have been listed in this year’s report. These brands have been classified into 284 different categories as against 213 categories in 2013. The 244-page report is available for Rs. 14000/-. An analysis of the 100 Most Trusted Brands in 2014 revealed that most brands were represented from Diversified with 11, Consumer Electronics with 10, Bath/Beauty with 9, Mobiles with 8, 4-Wheelers, Telephony, and 2-Wheelers with 4 each, and Personal Technology, Sportswear and Aerated Drinks with 3 brands each. “Among the top 100 Most Trusted brands, 75 were net gainers while 25 took a fall. The gainers gained an average of 86.23 ranks, while those that fell took a dip of 27.16 ranks on average, showing that the average gain among the top hundred beats the average loss in ranks by 317%. A connected surmise could be drawn that in the year that was slow for many, brands took the opportunity to focus more on their trust intangibles, scoring points in the process. For long term sustainability and success, it is important that brands have a long term investment in trust”, Chandramouli added.